Following the decision of seven Labour MPs to walk out on Monday, colleagues expressed anger with the leadership during a “tense” meeting in Parliament. Corbyn-critic Ian Austin said others would “think hard” about leaving unless it fixed its anti-Semitism problem. The BBC has been told two Tory MPs are thinking about joining the ex-Labour MPs’ independent group in Parliament. The BBC’s political editor Laura Kuenssberg said a small number of Conservatives were considering their futures amid unhappiness over the government’s Brexit policy. 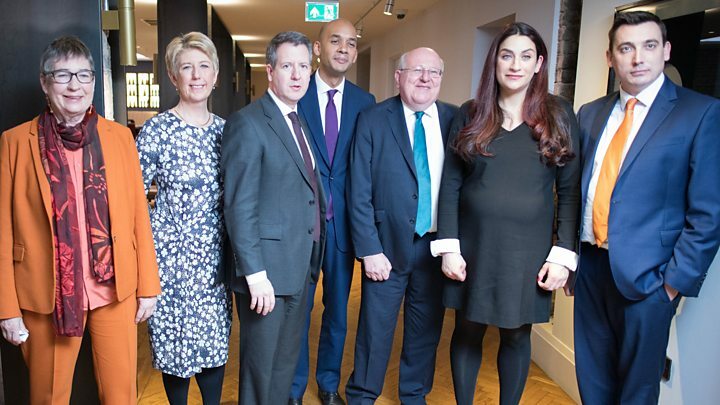 Chuka Umunna, Luciana Berger, Chris Leslie, Angela Smith, Mike Gapes, Gavin Shuker and Ann Coffey quit Labour’s ranks in protest at what they said was a culture of “bullying and bigotry” in the party and frustration over the leadership’s reluctance to back another EU referendum. The seven are not launching a new political party but have urged other Labour MPs – and members of other parties – to join them in “building a new politics”. 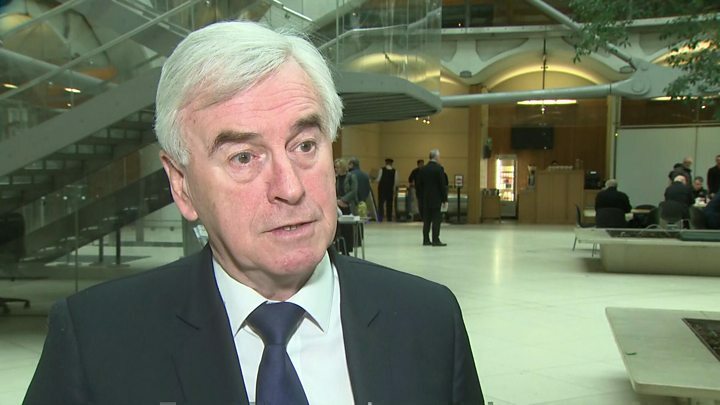 Their departures have provoked a mixed reaction at the top of the party, with Shadow Chancellor John McDonnell saying they should stand down and allow by-elections in their constituencies. But deputy leader Tom Watson said the move was a wake-up call for the party. He condemned those on the “hard left” who he said were celebrating their exit, saying he “sometimes no longer recognised” the party. Speaking after a Labour meeting in Westminster – addressed by party chairman Ian Lavery – Mr Austin said Labour must act to stop more MPs jumping ship. Mr Austin said Mr Lavery had failed to “demonstrate the leadership” and “understand the scale of the problem we have” with anti-Semitism within its ranks. “If that is the best the leadership can do, I can see more people taking the same course of action,” he said. The BBC’s political correspondent Ben Wright said several MPs thought Mr Lavery had misjudged the mood of the meeting by delivering a tub-thumping speech about being proud of the party. But he said he did not get a sense that other MPs were poised to join the splinter group. Party sources said Mr Lavery had insisted Labour must remain a “broad-church” and it was determined to root out the “appalling abuse” that Ms Berger in particular had been subjected to. Announcing her resignation on Monday, the Liverpool Wavertree MP said Labour had become institutionally anti-Semitic and she was “embarrassed and ashamed” to stay. So far they are not a political party, although they say they may evolve into one. So far they have no leader, and no policy programme as such. They are clearly open to welcoming disgruntled members of the Conservative party too. Their view is that our whole political system is broken and neither the Tories nor Labour fit for purpose. And it is possible within days that they might be joined by a sprinkling of Tory MPs. But the seven MPs rejected comparisons with the SDP which broke away from the Labour Party in the early 1980s but eventually merged with the Liberal Party. The Labour leader is likely to be pressed on the issue when he makes a speech on Tuesday in London on Brexit and education – in which he will announce the setting up of a new commission on life-long learning. Is Derek Hatton rejoining Labour? He is also likely to face questions over reports that Derek Hatton – the face of the hard-left Militant Tendency group in the 1980s – had had his application to rejoin the party approved. Mr Hatton, who was expelled from Labour in 1986, told the BBC that his membership had been approved although Labour said it could not comment on individual applications. Labour MP Siobhain McDonagh told BBC’s Newsnight that this “showed that no-one was listening” to centrist MPs who had fought to ensure Labour was not a “rump of a party” that was not interested in holding power. Meanwhile, Brexit Secretary Stephen Barclay is to brief the Cabinet on his latest negotiations with the European Union. The Department for Exiting the EU said he had a “productive” discussion with the EU’s chief negotiator Michel Barnier in Brussels on Monday.